Location: Haight St. and Buena Vista Ave. Founded in 1867 Buena Vista Park is actually the oldest park in San Francisco. Once a bare hill that mirrored the original dune and brush landscape of the western half of the city, due to a concerted tree planting effort by John McLaren, the famous superintendent of Golden Gate Park, Buena Vista is now one of the most wooded areas in San Francisco. From the occasional lookouts and windows through the tree canopy you can see how this park got its name—there are some great views. It’s worth making your way to the top of the hill for the view of the Golden Gate Bridge, and the view of St. Ignatius Church from the western rim of the park, perched on a hill with the rolling Marin headlands in the background, reminds you how San Francisco got the reputation as the most European American city. Buena Vista Park is a great off-leash dog park if both of you and your dog want a good workout. While the park lacks any large open spaces for dogs to pack up and roam, it has steep paved and dirt paths and winding wooden stairs in abundance. Within steps of entering the park from any of its many access points you find yourself surrounded by a cathedral-like tree canopy, your dog a few paces ahead, you have entered the temple of dog. Wind your way up the central ridge that rises from the Haight Street entrance at Buena Vista Avenue East and take a much-needed rest at the first lookout point. From the bench you can look northeast to the dog packs of Alamo Square Park and beyond to the East Bay. From there it’s a quick walk up to the highest lookout point and one of the few small grass areas where dogs are known to congregate. From the top there are many trails that circle down the hill, making this off-leash dog park one that’ll want to visit often. 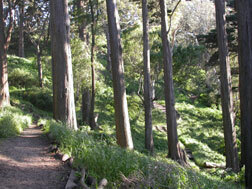 Buena Vista Park is located between lower and upper Haight a few blocks south of the tip of the Pan Handle. Haight Street forms its northern boundary, and it’s ringed by Buena Vista Avenues East and West. Like most parks in San Francisco there is no main parking lot, and parking around its perimeter can be difficult later in the day and on weekends. You’re more likely to find parking on Buena Vista Avenue the further you get up the hill from Haight Street. Make sure to bring your own plastic bags to clean up, and keep a close on eye on your dog if it’s not a herding type—the thick underbrush and winding trails have separated more than a few dogs from their owners. As always, keep control of your dog at all times. See our “Dog Park Tips” page for more advice.